Alan G. Brittin Jr. passed away surrounded by his family on Wednesday November 21, 2018. 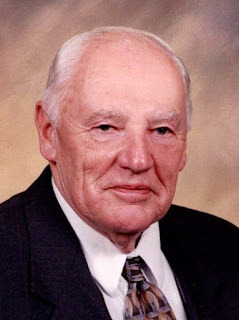 Born in Pendleton on November 3, 1923, he was the son of the late Alan G. Sr. and Mary Murphy Brittin. Alan retired as a Superintendent of Operations from the Huntley Steam Station, Niagara Mohawk, in 1985 after working for 43 years. He attended the Ridgewood Bible Church and was a member of the Niagara Mohawk 25 year Club. He is predeceased by his wife, Eleanor (nee Bowerman) Brittin, who passed away May 2, 2006. He provided an extremely solid foundation for the whole family. Alan was the father of Dale (Shirley) Brittin, Kent (Marcia) Brittin, Scott (Darlene) Brittin, Craig Brittin, Paul (Rebekah) Brittin and Ann (Jim) Hood. He is also survived by 16 Grandchildren and 23 Great Grandchildren. Alan was the brother of Dorothy (George) Knaisch and the late Gertrude Collins, Marian Brittin, Arthur Brittin. He is also survived by several nieces and nephews. Friends may call on Saturday Nov. 24th and Sunday Nov. 25th 4-8 PM at Prudden and Kandt Funeral Home, 242 Genesee Street, Lockport. A Funeral Service will be held on Monday Nov. 26th at 11 AM at the Ridgewood Bible Church, 7073 Ridge Road, Lockport, NY 14094. Interment will be in Glenwood Cemetery. Memorials to the Church or to Grace Ministries International, 131 Village Parkway NE #4, Marietta, GA. 30067, would appreciated by the family.